When you step into Frédéric Schendel’s stained glass atelier, you might think that you’ve been transported back in time. On the third floor of a Baroque-era building with wooden ceilings and gently curving walls, his workshop evokes the master craftsmen of yore. The space is filled with sketches, notebooks, all manner of tools, sheets of glass, projects in various states of completion, and heritage stained glass pieces waiting to be lovingly restored. It’s an artistic sanctuary that is peaceful and yet also alive, buzzing with creativity. 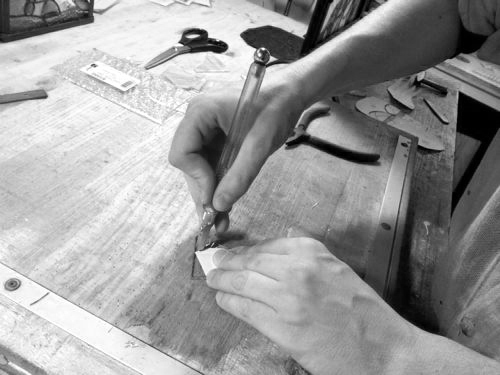 Originally from France, Fred has lived in Prague for the past nine years, drawing inspiration from the gothic and art nouveau stained glass traditions of the Czech Republic. 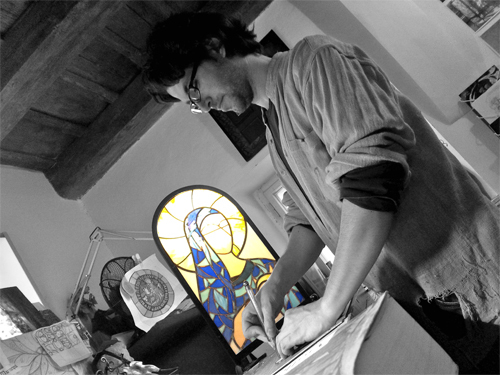 He creates original stained glass works under the name Chefraled in vitraux; in addition, he teaches stained glass courses and leads art history walking tours through Prague’s historic landmarks. Fred also organizes international art markets in Prague, like the RU.KA.MA. Art & Craft Market we wrote about last week. Fred spoke to Herb and Lace about stained glass, his artistic inspiration, and what he loves about Prague. When I was 15 years old, I visited the Cluny museum in Paris. In this museum, there’s a dark room with stained glass from the 13th century. You can look at them up close–normally, stained glass windows are installed 15 meters above you. You could see all the details in the windows. I was shocked: I realized how precise and fragile the work was. I decided then that I wanted to try and do something like this. I was in love. How did you study to become a professional stained glass artist? I started by myself, painting on glass to imitate stained glass. When I realized that I really enjoyed the work, I began taking classes at my university in Paris. I took art classes at night with an Iranian teacher. It was then that I began to learn traditional and well-known stained glass techniques, like working with lead came. I continued painting on glass, and began selling my work. On the side, I also studied at the Forney library in Paris, where I consulted technical books about stained glass. After Paris, I moved to Barcelona so that I could study the techniques of modernismo. This is another side of stained glass, exemplified by the Palau de la Música in Barcelona and the works of Domènech i Montaner. Then, I moved to Prague. I started working in a very old restoration workshop that has existed since 1935. This workshop helped to create the original art nouveau stained glass windows in St. Vitus Cathedral, with Max Švabinský. I worked there for six years, and had the opportunity to get a behind-the-scenes look at some of the most incredible places in Prague: St. Vitus Cathedral, the Charles Bridge, the Powder Tower. I worked on heritage sites in Prague and outside, around the Czech Republic. When did you start your own studio? At the end of 2009. I started my own workshop so that I could focus on my own creations. I also teach classes here. I’m in the heart of Malá Strana. Do you draw inspiration from your immediate surroundings? Yes, even from this building. It was built-in the 14th century, and that’s the period I’m most interested in. You feel the influence of past centuries– in the wood of the ceilings, in the statue outside [in Maltézské Náměsti]. It’s hard to summarize. What’s it like being an independent artist in Prague? I rely a great deal on word of mouth. I also attempt to organize markets with fellow artist friends [like the RU.KA.MA market]. It’s a way to reach people and demonstrate our passions. We also have hands-on activities for children. I’ve been involved with the local French school, teaching classes to children. In addition, I work in cooperation with the French Alliance in Plzeň. How would you describe your style and your influences? The advantage of stained glass it that there are hardly any limits, technical or artistic. Stained glass is typically associated with religious art, but really everything is possible. You are not limited to one style. I can experiment and mix my interests. The medieval style from the 12th and 13th centuries and art nouveau (from my time in Barcelona and Prague) are my foundations. I also try to add in my passion for Precolumbian and Celtic art. For example, I made a series of stained glass pieces called Monokrom, which was influenced by the Incan walls in Cuzco. Art nouveau influences me a lot–the idea that art is in everything, in every detail of a city. This concept motivated me to work not just on windows, but projects like folding screens. I like to say that stained glass is mise en tension de la lumière–stained glass traps the light and you can create a lot of effects with this. I love to combine techniques like lead, copper foil, fusing, and painting on glass. You can make everything from jewelry to monumental church windows. What are some of your favorite places in Prague off the normal tourist trail? Maltézské Náměsti, where I live and work. The Church of St. Michael on Petřín hill, a wooden Orthodox church transferred in the 1920s from Subcarpathian Ruthenia (now Ukraine). The Apolinářská neighborhood. The area around St. Agnes convent. The pasáže, especially Lucerna–these passageways feel like ant farms! This entry was posted in Chat, Prague and tagged camilla, chat, chefraled, chefraled in vitraux, fred schendel, frederic schendel, stained glass. Camilla was raised in the San Francisco Bay Area and started traveling the world before she could walk. She’s eaten khachapuri in Georgia, ridden a camel through the deserts of Rajasthan, and hunted for mushrooms in the Dolomites. After a stint living in Prague (and several other beautiful cities), Camilla is back in her native California for graduate school.